Women have got a tough deal. We get paid less (on average) than men yet are expected to shell out more on products - despite them being virtually identical. A type of gender discrimination that you probably didn’t know existed. Look at a pair of scooters from major US retailer Target. The red scooter (marketed at boys) costs $24.99 while the pink scooter (marketed at girls) costs double that. You’d be forgiven for thinking that the pink scooter is better but there’s zero difference between the two. Both have plastic handlebars, three wheels and a foot brake, and both weigh approximately five pounds. So why is the pink version so much more expensive? When asked, Target claimed the pricing was a “mistake” - slightly convenient, eh? These scooters are by no means the only goods to feature such an obvious price gap. A recent study conducted by the New York City Department of Consumer Affairs looked at almost 800 products with male and female versions and found that women are constantly being asked to pay more. 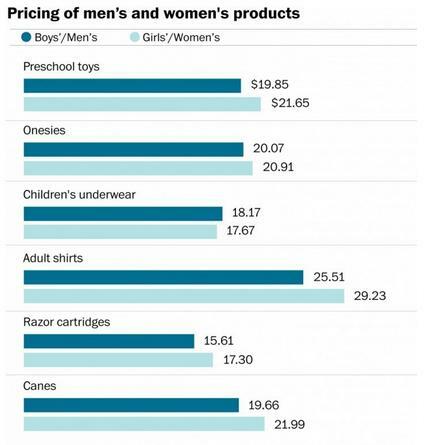 On average, items aimed at girls and women cost seven per cent more than the male equivalent. In response, Menin’s urging shoppers worldwide to call out brands for gender discrimination on social media by using the hashtag #genderpricing. The largest price discrepancy was uncovered in the hair care category. The researchers found that, on average, women pay a jaw-dropping 48 per cent more for everyday items like shampoo and conditioner. But usually all they’re paying for is the scent. Who knew a couple of drops of coconut oil could make a product cost so much more? 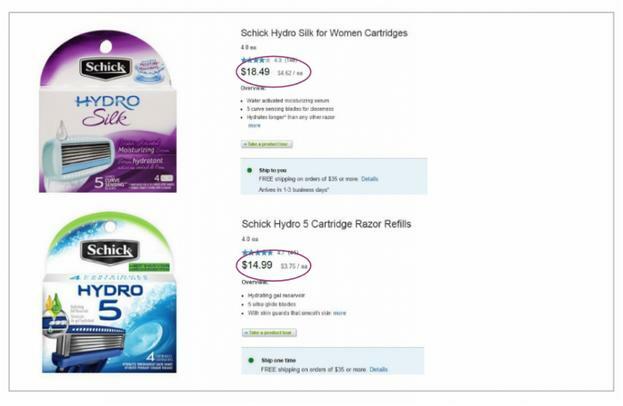 The price of “female” razors was found to be almost as shocking when compared to styles aimed at men. Clothes for women are always more expensive, too. Levi’s charges $68 for its 501 jeans for men and $88 for its 501 jeans for women, reports The Pool. These price differences based on gender go beyond products. Women have always paid more to get their hair cut and styled – even though giving a female customer a trim may be quicker than giving a male customer a cut. However, men often get the raw deal with things, too. Guys often have to pay more to get into clubs (in an effort to keep the male/female ratio even) and they generally pay more for car insurance, too. One thing’s clear – we may’ve come on leaps and bounds in terms of making life more equal for men and women, but there’s still a lot of work to do.